This sponsored post is brought to you by Raymour & Flanigan Furniture. Welcome to the Raymour & Flanigan $500 Gift Card Giveaway! My Best of Both Worlds did not receive any compensation in exchange for this publication.This giveaway is hosted by Megan from Housewife on a Mission and My Best of Both Worlds is very excited to participate in this giveaway. Make sure you pop over to Megan’s blog to check out all of her great reviews and features- you won’t be sorry. The following is a guest post written by Megan from the blog Housewife on a Mission. All opinions are her own and may differ from those of yours. This week launches the Holiday season, and our family is so excited! 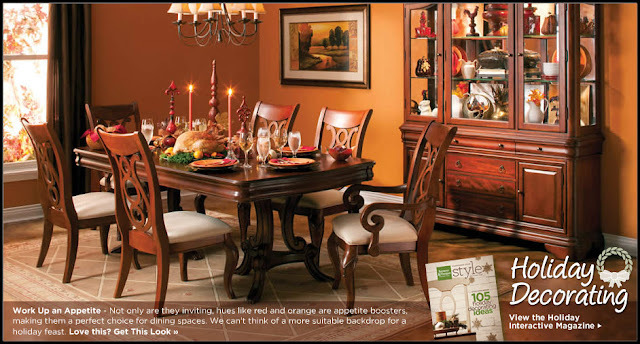 I love decorating our home for both Thanksgiving and Christmas, and as you can see in the picture below, Raymour & Flanigan helps make furnishing and decorating your home very easy. looking for at a price that’s just as appealing. Recently I was given a Raymour & Flanigan gift card to purchase a Youth Bedroom Chest to review- you can read my review here. I really enjoyed my experience shopping at Raymour & Flanigan, mostly because of the terrific customer service from our salesman and the rest of the staff. If you are search of new furniture, rugs or even home decor, I definitely recommend you checking out Raymour and Flanigan. Not only was their customer service great, both their products are solid, well made and they have great prices as well. Connect: Find out more about Raymour & Flanigan Furniture by visiting their website. Then make sure you “like” them on Facebook, follow them on Pinterest and on Twitter too! Giveaway Tools entry form below. Good luck! New York, New Jersey, Road Island, Delaware, Connecticut, South Massachusetts, and East Pennsylvania. If you do not live in one of the above states, please consider Raymour & Flanigan’s shipping policies: they only ship (for free) home decor items anywhere in the US. You can use this store locator link to see if a Raymour & Flanigan is near you. Disclosure: This promotion is in no way sponsored, endorsed or administered by, or associated with, Facebook. Prize fulfillment is solely the responsibility of Raymour & Flanigan and not by Housewife on a Mission or My Best of Both Worlds. My Best of Both Worlds did not receive any compensation in exchange for this publication and is not responsible for sponsor prize fulfillment. My Best of Both Worlds just loves to collaborate with other great bloggers to bring readers like you fantastic giveaways!! I’d get the Galveston Bedroom Dresser. Hi, I’d use it toward the Madelyn sofa by Kathy Ireland. I have a college son sleeping on the current sofa and it’s past its prime. Thanks for the giveaway!